Inspired by the recent popular discontent expressed so colorfully on Wall Street, I offer this proposal: Occupy Sprawl! People are not happy with the economy, with politics, with the government. Consider the physical surrounding of the protesters: the streets and squares in lower Manhattan where there are plenty of places to gather. Good urbanism provides good spaces for assembling and protesting. Our sprawling suburbs are devoid of such places. Where can people get together to show frustration (or to celebrate)? Are people happy with their physical environment in sprawl? Why not revolt against the system of sprawl, which is responsible for some of the most serious environmental, economic, social and health problems in recent history? Sprawl has been central to our economic troubles: the mortgage meltdown, dependence on cars and oil, pollution and waste of resources to mention just a few. Sprawl has even been blamed for the death of the American dream itself. How about taking on sprawl in the passionate way the protesters are taking on Wall Street? The metaphor of occupation can serve us well in the quest to reform sprawl because we will need a dramatic overhaul – of the physical pattern, of the law, of the financing mechanism that created, supported and encouraged sprawl for decades. The whole system must be shaken from its foundations, in the same way the occupiers demand systemic changes on Wall Street. There is so much to occupy in sprawl! People should reclaim the empty, unproductive, wasteful spaces: over-scaled parking lots, empty big boxes, dead malls, vast front lawns, foreclosed McMansions, massive cul-de-sacs, underperforming golf courses, etc. 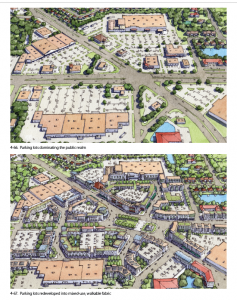 Suburban strip corridors can become main streets and boulevards, malls can incubate much-needed town centers, deserted McMansions can house students and seniors, and parking lots can be transformed into productive community gardens. There is a direct connection between Wall Street and the future redevelopment of sprawl. A few years ago Christopher Leinberger identified 19 real estate categories or standard product types preferred by Wall Street and showed the need to provide new alternatives that are walkable, diverse, more resilient. The redeveloped sprawl types will be the new products in the Wall Street toolbox. The good news is that things are already moving. The New Urbanists have been building numerous projects redeveloping sprawl, piling up experience and success. Sprawl is under attack from many sides ­ from the grassroots as well as from the private and the public sectors. The market is shifting towards more intelligent, human-scale urban patterns and Wall Street is paying attention. Adam Ducker of RCLCO pointed out in his CNU presentation on the economic context of sprawl repair, that walkscore is becoming a Wall Street underwriting tool. But more voices and hands are needed for this Herculean effort. The resources are here and plentiful; just help yourself. Use the strategies from Retrofitting Suburbia, the toolkit of the Sprawl Repair Manual, the maneuvers of the Tactical Urbanists, the interventions of Incremental Sprawl Repair and Planned Densification, the common sense of the Original Green, the sustainability of Rainwater-In-Context and Light Imprint, the techniques for re-zoning sprawl of CATS and get support from the many minds of the CNU Sprawl Retrofit Initiative. Get out and Occupy Sprawl!